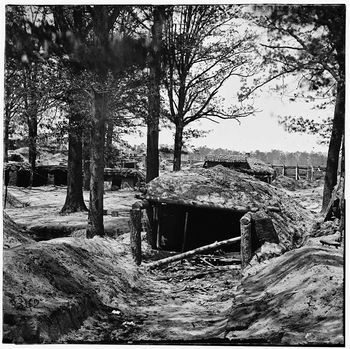 Fort Stedman (1864-1865) - A U.S. Civil War post established in 1863 by Union forces near the City of Petersburg, Virginia. Abandoned in 1865. Constructed in 1864 by Union engineers as a six sided earthworks fort designed to be defended from all sides. The fort was armed with six or more cannon and garrisoned by some 300 Union infantry troops. The post was unusual in that the engineers had left a number of large trees standing inside the earthworks. The interior of the post had a number of bombproof huts for the officers and bombproof magazines for powder storage. This fort was only 300 yards from the confederate lines and within rifle range. Between the lines ran two heavy lines of chevaux de frise (sharpened log barricades) meant to impede any direct attack by either side. On 25 Mar 1865 Confederate forces under General James A. Walker mounted a surprise attack at 4:30 AM and captured the fort and started to advance beyond the fort toward Union supply lines. 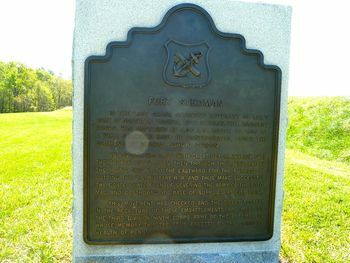 Union reinforcements gathered and drove the attackers back to Fort Stedman killing or capturing most of Confederates. 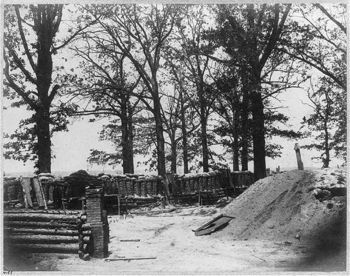 Union forces reoccupied the fort and held it until it was abandoned after the fall of Petersburg and Richmond. 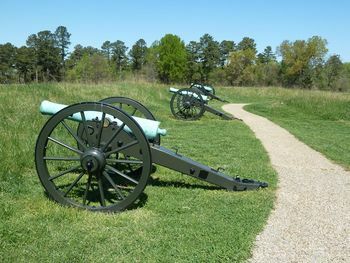 Part of Petersburg National Battlefield Park, Petersburg, Virginia. Two markers and six emplaced cannons on field carriages. Location: National Battlefield Park, Petersburg, Virginia. This page was last modified 10:37, 17 March 2019 by Bill Thayer. Based on work by John Stanton.